Doesn't it blow your mind how creative humans can be? Summer of SW8PaperAndStuff made a fun pun out of beautiful handmade finds. 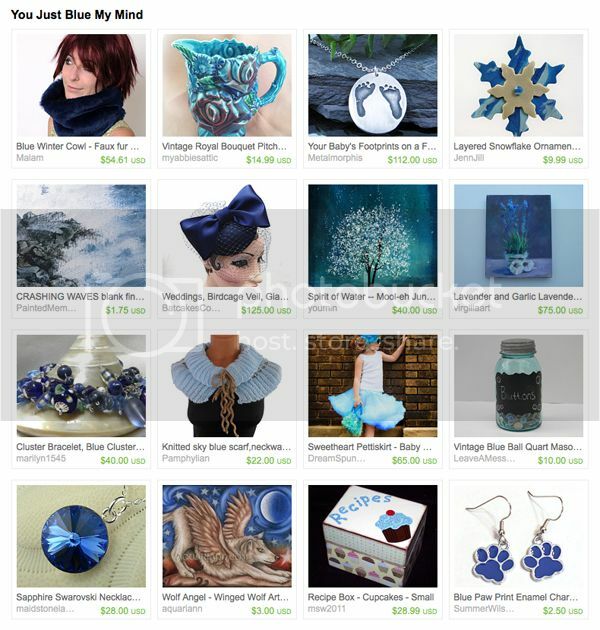 Her blue gift ideas include personalized baby footprint necklace by Metalmorphis, paw print earrings by SKW Originals and my winged wolf magnet. Thank you for featuring my treasury!!! Whoa. That's an awesome pitcher at the top. It totally caught my eye! Great play on words and beautiful finds! Your winged wolf reminds me of my dogs - they love to bow down like that! Love all the blue! The colors of the sea are my favorite this year. Everything blue is catching my eye. Thanks for always putting this together, Kristin!